This movie produced by the Nargis Dutt Memorial Cancer Hospital, Barshi and Tata Memorial Hospital, Mumbai, India is used in villages to promote the cervical cancer project and to inform the population. Start the movie (Windows media player format for fast internet line). Kill Or Cure? Human Papilloma Virus [HPV] leads to cervical cancer, and is the second-biggest cause of cancer deaths among women, claiming nearly 300,000 victims annually. The BBC World third series of “Kill Or Cure?” starts by looking at screening strategies to prevent cervical cancer and the development of a vaccine that aims to protect against HPV, in a documentary that has been filmed in Costa Rica and India. 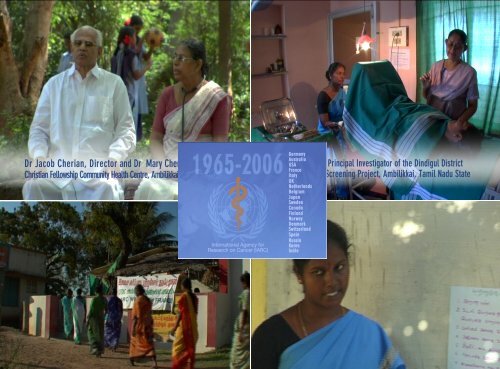 This episode stars our Group Head, Dr R. Sankaranarayanan as well as our Alliance for Cervical Cancer Prevention (ACCP) collaborators Dr Ramani Wesley from Trivandrum (Kerala) and Dr Esmy from Ambilikkai (Tamil Nadu). This 30-minute programme will help you discover our projects and fieldwork. First transmission on BBC World, Friday 7th October 2005. Start the movie (Windows media player format for fast internet line). Film about cancer research activities in India. This 17-minute programme will help you discover our screening projects and fieldwork in India especially in the site of Barshi, Maharastra, India. Film about cancer research activities in India. This 11-minute programme will help you discover our screening projects and fieldwork in India especially in the Trivandrum city, Kerala, India. Start the movie (Windows media player format for fast internet line).